Binary Scam Alerts is issuing a severe SCAM notice in regards to the Deep Net Trading Signals (AKA Deep Net Software, Deep Web Signals and App). After a careful examination and review of this system, our staff of relentless researchers has come to some disturbing conclusions about this fake software. 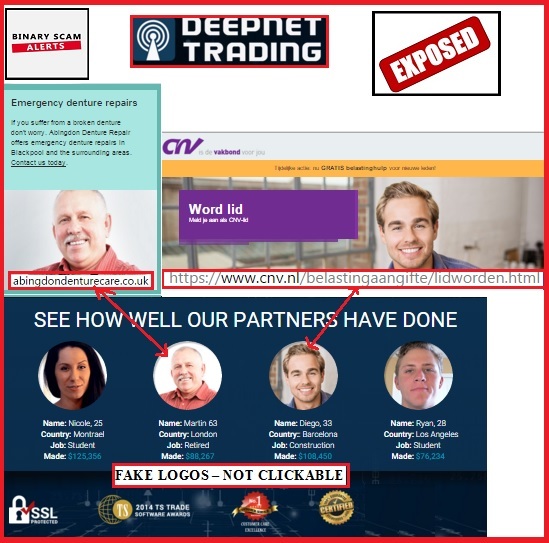 Below you will find a screenshot illustrating the exact method of operation and tactics employed by the con artists who dupe and deceive day traders wanting to profit online from binary options trading. “Diego” is an image bank actor and he is selling a Dutch tax returns service for a company called CNV. “Martin” is posing as a happy customer in a UK denture repairs site. Nicole and Ryan are also actors, but I think the point has already been made and confirmed. If you try clicking on the logos you will see they lead nowhere, and they are also labeled as something which is too generic and has no real significance like “TS Trade Software Awards” (umm, what’s that?). I really fail to understand why they keep making the same errors and don’t learn from their mistakes, it absolutely boggles the mind. No Proof of Winning Trades! Usually even the most fraudulent website will try to give you some sort of proof, this stupid software doesn’t even try to do that. If you believe in the sentence “the proof is in the pudding”, I have yet to see that pudding. Remember, the only proof of winning trades you will ever need is the actual trading history from inside the broker account. BTW if you somehow manage to see the proof please let me know. Signals are probably the most profitable of all trading tools available today if used correctly. However, this system is rigged and that is an absolute fact. If you are providing fake testimonials and forcing people to choose a specific broker without involving them in the selection process then you are a ripoff artist and have absolutely no integrity or moral ethics. So Deep Web scores zero on transparency, and does not allow the trader to do research of any kind in relation to the broker they are working with. If this is the case, then there is no need for sophisticated charts or market analysis tools. You will never hit ~80% ITM ratio on trades with this garbage software so don’t worry about trading the news, scalping, or technical trading. The only thing you need to concern yourself with is how to exit this software and delete it from your computer and hard drive. The signals software is a suggestive format designed to indicate winning trades based on technical analysis as well as other indicators. Technically speaking, it is supposed to tell you exactly what contract to buy and also factor in the expiry time. However, in reality it’s just some garbled code which takes a random asset pick at best, and most likely it’s choosing inferior trades that will intentionally cause you to lose your money. The software is free, but you will need at least $250 to qualify to use it. In all honesty, if you can look in the mirror and actually tell yourself it’s possible to make a million dollars from a $250 investment you are probably in denial or in dire need for a quick-fix make money program. These things simply won’t work and you will eventually find yourself another one of many victims who are constantly complaining about how they are getting scammed. Similar Scams include the malicious Copy Buffett, Centument, Citidel Ltd, Tauribot, Push Money App, Zulander Hack, Millionaires Blueprint, Binary Matrix Pro, Trade Fusion, Profits Unlimited, QBITs Megaprofit, and Altronix App. Binary Scam Alerts endorses the Binary Profit Method since we have tested this signals software and it has been a consistent performer. 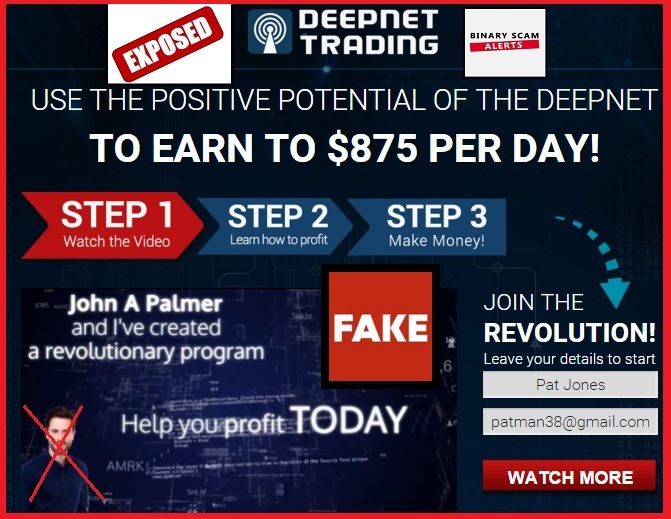 The Deep Net Trading Signals and Software and John A Palmer the actor is a verified SCAM. There is nothing genuine, legit, or honest about this piece of trash software besides the intent of the con artists behind it to cheat you out of your money and split the profits with an offshore, unregulated broker. Our staff strongly advises you to stay away from this APP dubiously called Deep Web Signals, and refrain from using it in any shape or form. If you have fallen victim to this vile scam, please contact us and we shall try to assist you in recovering your stolen funds. Don’t forget to join our Facebook Group and Subscribe to our YouTube Channel.